Professional Focus Dr. Haas-Kogan is a Board Certified Radiology Radiation Oncologist- Pediatrics. Dr. Haas-Kogan is a Professor of Radiation Oncology, Harvard Medical School. She has an active laboratory-based research program that investigates novel therapeutic agents for adult and childhood brain tumors, as well as pediatric malignancies. Haas-Kogan is the principle investigator for several clinical trials, including investigator-initiated studies and cooperative group trials run by the Children’s Oncology Group NCI and the Pacific-Pediatric Neuro-Oncology Consortium. A widely published author, she has also received accolades for excellence in teaching and exceptional care delivery. 1998 UCSF Dean representative to Association of American Medical Colleges Professional Development Seminar for Junior Women Faculty, Santa Fe, New Mexico. 1999 Pfizer Scholars Grant for New Faculty. 1999 First place: CAP competition, General Clinical Research Center National Meeting; Arlington, VA.
1999 UCSF-Mount Zion Clinical Investigator Award. 2000 American Society of Clinical Oncology Career Development Award. 2002 Henry J. Kaiser Award for Excellence in Teaching, UCSF School of Medicine. 2002 UCSF Nominee, Assoc of American Medical Colleges (AAMC) Humanism in Medicine Award. 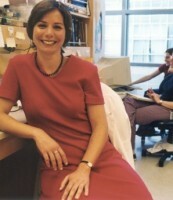 2003 Nominated for Teaching Award, UCSF School of Medicine. 2004 Nominee: Henry J. Kaiser Award for Excellence in Teaching, UCSF School of Medicine. 2005 Selected one of Best San Francisco Doctors for San Francisco Magazine, January 2005. 2006 Alpha Omega Alpha, nominated by Medical Student Class of 2007 for AOA membership in the alumni category at the University of California, San Francisco. 2009-10 Mentor: Howard Hughes Medical Institute Research Training Fellowship for Medical Students. Clinical outcome and prognostic factors for central neurocytoma: twenty year institutional experience. Medical Student Perspectives on a Multi-institutional Clerkship Curriculum: A Report From the Radiation Oncology Education Collaborative Study Group. Quality improvement of International Classification of Diseases, 9th revision, diagnosis coding in radiation oncology: Single-institution prospective study at University of California, San Francisco. Standardization and Quality Assurance of Radiation Therapy Volumes for Adults With High-Grade Gliomas. Pure germinomas of the central nervous system: treatment strategies and outcomes. In Reply to Bull et al. Likelihood of Bone Recurrence in Prior Sites of Metastasis in Patients With High-Risk Neuroblastoma. Targeting Wee1 for the treatment of pediatric high-grade gliomas. Where are we now? And where are we going? A report from the Accelerate Brain Cancer Cure (ABC2) low-grade glioma research workshop. Purged versus non-purged peripheral blood stem-cell transplantation for high-risk neuroblastoma (COG A3973): a randomised phase 3 trial. Feasibility, safety, and indications for surgical biopsy of intrinsic brainstem tumors in children. Risk of First and Recurrent Stroke in Childhood Cancer Survivors Treated With Cranial and Cervical Radiation Therapy. Poly (ADP-Ribose) Polymerase Inhibitor MK-4827 together with Radiation as a Novel Therapy for Metastatic Neuroblastoma. PDGFRA Amplification is Common in Pediatric and Adult High-Grade Astrocytomas and Identifies a Poor Prognostic Group in IDH1 Mutant Glioblastoma. Molecular targets and mechanisms of radiosensitization using DNA damage response pathways. Genotype-dependent cooperation of ionizing radiation with BRAF inhibition in BRAF V600E-mutated carcinomas. Tumor Dosimetry Using (124)Im-iodobenzylguanidine MicroPET/CT for (131)Im-iodobenzylguanidine Treatment of Neuroblastoma in a Murine Xenograft Model. Hepatocellular carcinoma: natural history, current management, and emerging tools. PTEN promoter methylation and activation of the PI3K/Akt/mTOR pathway in pediatric gliomas and influence on clinical outcome. The superiority of conservative resection and adjuvant radiation for craniopharyngiomas. Reduced phosphocholine and hyperpolarized lactate provide magnetic resonance biomarkers of PI3K/Akt/mTOR inhibition in glioblastoma.